Each week this winter, we'll be profiling a different Division II & III corps in a feature called "On the Field." Michael Butler, director of Teal Sound, submitted this installment. 2003 was a great success for Teal Sound. Although the corps was unable to make finals, the organization came together as a unit both on and off the field. The lessons learned over the past five years blossomed in 2003. The corps' sound, look and overall operations became mature. The corps took in Paradigm winter guard under the Teal Sound Youth Arts Organization umbrella. This brought along a highly talented guard staff and members. 2003 marked the best guard unit the corps has every put on the field. ^The brass staff was blessed to have Mark McGahey of the Cavaliers as their brass consultant. Teal Sound uses the same techniques and approaches the Cavaliers' brass line uses. Mark helped turn what had been a weakness of the corps into a strength. The Future On Sept. 26, 2003, Teal Sound held a reorganization meeting in Hilton Head, S.C. Director Michael Butler stated the corps has accomplished their goal of putting a corps on the road for the past five years. It is time to set new and higher goals. Butler unveiled his five-point plan and business strategy for the next four years. Teal Sound has set a goal of becoming a Division I corps by 2007. The plan involved a change in the way recruiting, fund-raising, bookkeeping, travel, parent interaction and, most of all, the look of the corps. The corps will be sporting a new logo and uniform in 2004. The corps is bringing back the tradition of performing contemporary recording artists' music. The corps is doing the music of Dream Theatre this year. The show will have the unique Teal Sound stamp on it. The Nov. 29-30 audition camp was the best in four years. The corps had more than 100 attendees. The new recruiting strategy has paid off in a big way. One of the changes in fund-raising the corps is developing is a recording artist concert series in Jacksonville, Fla., Gainesville, Fla., and Tallahassee, Fla. "I don't know how to run a successful bingo and I am not even sure that is were the money will be in the next 10 years, But I do know the recording industry and concert promotions," said butler. He feels this will be the key to funding the lofty goals and expectations for the future. History Twenty years ago, approximately 200 kids turned out in a Jacksonville, Fla., park in hopes of forming a community-based drum and bugle corps. The event was entirely orchestrated by three high school students with a burning desire to bring drum corps to their city. With fliers in hand, the teen-age corps founders took to the streets and put the word out. It took off like wildfire, and on audition day, over 200 young corps hopefuls filled a city park with band instruments, as they did not have bugles. After a couple of rehearsals, the three students realized they lacked the needed funds and experience to make their dream a reality. They tucked their dream away, but it did not die. In 1998, two of the original three, Michael Butler and Danny Clark, came back to pick up where they left off in 1983. 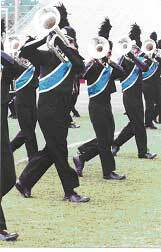 The ball started rolling for the North Florida corps, now known as the Teal Sound, in March of 1998. Support for Teal Sound was gained from the Jacksonville Jaguars NFL football team (that's where the "Teal" in the name Teal Sound comes from). They gave the corps their first $10,000 grant, and the corps was on its way. Teal Sound received an enormous response from interested participants. When open auditions were held on Jan. 23, 1999, over 120 participants attended. Initially Teal Sound did not even expect to tour in 1999, but intended only to go out for exhibition as a Division III corps. But because things shined brightly for the new organization, it was decided that a limited tour as a Division II corps would be financially feasible and would be beneficial for its members. On July 23, 1999, after six months of weekend rehearsals, the members and staff of Teal Sound boarded busses and headed for Brunswick, Ga., for a final week of everyday rehearsals before embarking on a two-week tour up the east coast, into Canada, and finally to Madison, Wis., where the corps finished in ninth place in Division II. It is not too late to join Teal Sound go to their Web site tealsound.org for camp dates and info. Read "On the Field – Fever"